Smashing its way into the ring and onto the Xbox 360 is EA’s latest boxing sim, Fight Night Round 3. The third in a very successful series, would it have the stamina to go all the way, or would it get knocked down early? Time to find out. One thing that I want to make clear from the start is that Fight Night Round 3 (FN3) is possibly one of the most visually stunning games that you will ever see – and it really is the perfect showpiece for Microsoft’s dream console. The fighters on display not only look perfect before the match, but you can visually see them getting bloodied and bruised as the fights wear on. It’s about as life-like as you could possibly want. If the boxers look amazingly real, then the same must be said for the environments. From the local boxing gym, to Madison Square Gardens – each environment is captured superbly, providing just the right atmosphere for your boxers to compete. The game itself is an absolute joy to play, especially now that EA have perfectly implemented their Total Punch Control. 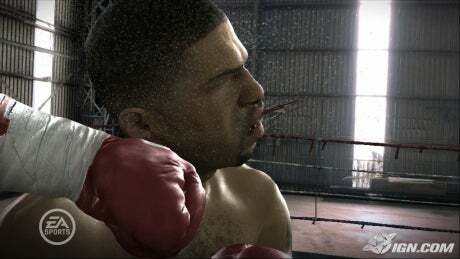 Allowing the player to use the analogue stick to perform a series of brutal jabs and punches proves to be an absorbing experience, you are one with your boxer and you feel every single punch thrown and taken. As with so many of their sports titles, EA somehow manage to put the player in the heart of the action so well – for a split second, you are in the ring rather than watching it on your television screen. The game offers so much more than just a simple scrap, however. 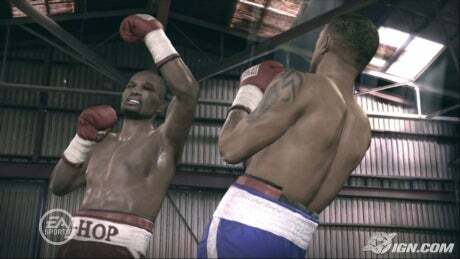 Career mode, classic fights, multiplayer, and a create-a-boxer are all present – each mode offering just that little bit extra, and enough to keep even the most avid boxing fan busy for quite some time. The career mode alone can take many weeks to complete, and once you’re the champion you can see how many times you can defend your belt, meaning that the game can ultimately last as long as you want it to. And if you get bored of playing by yourself, why not challenge a friend to a duel either online or via the many multiplayer options available. FN3 is brilliant fun when you’re playing with a group of friends because its not just a game now, you’re fighting for bragging rights all of a sudden! Overall EA Sports FN3 is a wonderful title, and one that really shows what the Xbox 360 can do. Visually I’ve not seen anything that can match it, and the quick and easy gameplay make it one of the best sports simulations available on the market. If you’re looking for a new game to add to your collection, then look no further. EA Sports Fight Night 3 is available from stockists now, priced around £49.